It's time to make an upgrade to this Clipper Ultra-Lite! 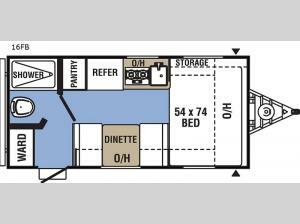 You will find sleeping space for three tired campers on a full size bed, and a booth dinette once folded down for the evening. The two burner range, microwave, and the refrigerator offer everything you need to make your favorite meals including a pantry for your dry goods. The private toilet and shower room allows you to get cleaned up and ready for your next outdoor adventure. You will also find storage inside and outside, plus more!